Club Penguin Cheats by Mimo777 Club Penguin Cheats by Mimo777: Club Penguin Puffle Party & Play! Woot! The Puffle Party will be here from February 19-25! Last year's Puffle Party brought the the white puffle to Club Penguin so this year there will be a white puffle room at the party! Coolio! The Secrets of the Bamboo Forest will be at the Stage on Feb 12th! The Bamboo Forest is home to a Monkey King! Good job to all you that guessed the picture had a monkey tail in it! In this play we have to find the ledgendary Golden Feather and go "beyond" the Stage! Hmm, sounds like another hidden room and giant pin! Saweet! Here is some cool trivia for you: The oldest penguin on the island would be 1565 days old this week! Let me know what you think about all this latest news! im SOOOOO exited!!!!!! rock on mim o! in the play i think i also saw a penguin dressed as some kind of bird. hmmmmmm? it is so different from now. I experienced Rockhoppers first appearance, even the first player backgrounds! Lolz my penguin is 1114 days old. I came on Club Penguin for the first time during the snow party! It was like a celebration that I joined!Lolz! can you announce the winners of the cave haiku contest! Yo mimo! Guess what? Theres a new thing that has come to tootsville! It's called TOOTSBOOK! It just came out and it's awesome! Also theres a new store in the tootsville mall! Go check everything out! I agree! MAKE THEM SMALLER AGAIN!!! I hated it when MY membership expired, I got it back again, though, so I bet you'll get it back soon, too! I knew about the orange brown and magenta when it came out last. That's old news. wow puffle party starts on my b'day! (19th) cool! and dark pink y in puffle party! this is the first time i commented on your website and my club penguin account is 1132 days old! i wonder how old is your penguin? Maybe this leads to the orange or brown puffle! AWSOME! Wow! Cant wait till the play! Cant have too much card-jitsu! Mimo did say that he and someother people did notice it so its no really "old news" . Mimo is just telling people about it. Really? First comment evar? Congrats! We hope to see you comenting more on Mimos Blog! Sweet! You get double treats! Happy Early Birthday and see you at the party! Hmmmmm is right. Maybe there is some kind of rivalship..... it will hopefully be reaveled. LOL Funny thought, Imagine a penguin in a monkey suit! my penguin is 1316 days old. I remember when rockhopper ship appeared and we thinked that they were going to destroy the island. hey mimo, that trivia was helpful, that means my old account greentedddy would be 1215 day's today!~!!!!! Wow your first time! and that's one old penguin! and congrats for getting membership. Hope to see your comments in the future! WOW! You are PURTY old!! On the puffle party pic, the white puffle is in this cute skate just for puffles! It's soo cute! Is it gonna come out...? I am getting up there: 1036 days old!!! hey mimo! have you noticed that the newspaper didnt mention anything about the new clothing catolog? It's actully on Feb.14th, Valentine's day. Probably just a costume from an old catolog. Mimo, the banner for this year's Puffle Party (with the new letter colors) is the same as last year's banner. Maybe that means that all of the new colors will be all of the possible puffle colors????? That would mean that there are only going to be 11 puffle colors...I hope my theory is wrong! Oh cool! My penguin is 1212 days old today! Hey Mimo! Cool fact if you play harvest moon there is a blue feather that looks like the orange one on the secret of the bamboo forest play thing!! Sorry about the long sentence I'm a chatter box!! calm down! he will announe it. There were like 300 entries! It will take a little while! No! My penguin is 5000 days old! I dont know but Im pretty sure were all wondering that same question. Try sending Club Penguin and email. If you find something out. Mimo may give you credit! My penguin is 1201 days old! How old is your penguin Mimo?? Sweet. I remember it last year and the underground pool was where the black puffles could skate and the windows would close their blinds. Good times, good times! If you Look closly at the front page with the pink puffles,You will relize that the pink Puffly area will be at the ice burg. nice mimo i think on the puffle party there will be orange and brown puffle 2 i dint even notice that! My penguin Erry Tay turns 1000 days old tomorrow!! I'll be 1100 days old tomorrow. Btw, is it how many total days you've been on CP or how many days you log on that counts into your age? Happy 6th Credit to you! Happy 6th Credit to Safa153.. Happy 6th Credit to you!!! lol my penguin is 1089 cp is fun? mimo when are you going back on webo? 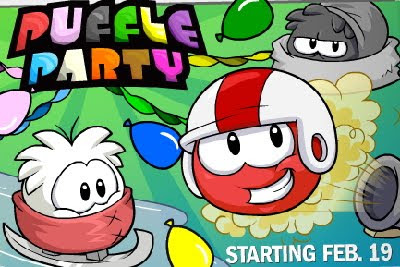 Look at the Puffle Party logo. The colour of the letters match the colour of the Puffles. Wait is it just me or is the R in the Party! orange o.0 might there be an orange puffle on the way ? ha! i am just a year younger than the oldest penguin! I am SO excited about the puffle party too! My igloo is full of them! Rock On! And I hope you enjoy! He is pretty old but not beta! Hope this helped!